My one true love thinks nobody, anywhere, has ever really liked cake. His assertion – which is stated each and every time I bake anything, really – dates back to the way-too-big supermarket sheet cake we picked up for my son’s third birthday party (don’t judge, my daughter was just 3 weeks old at the time). His conviction was sealed by the considerable leftovers, with their inch-high, extra sugary no-real-butter-in-the-buttercream frosting that sat on the counter for over a week before we dumped them. Maybe what he really means is that nobody, anywhere, really likes wasted cake? I was recently told that wasted cake is one of the drivers behind brides who want simpler, greener weddings skipping the four-tiered, bling-heavy cakes in favor of simple cupcake spreads. While the overall top-selling cupcake made by Love Kupcakes head baker Kayla Lindsay is gluten-free sea salt caramel chocolate, this combination is highly favored by brides and grooms. Love Kupcakes, located on the second floor of 28 Monument Square, in the Public Market House, will be relocating to a ground-level retail space at 469 Fore St. in April. To make the cupcakes, gently combine all dry ingredients in the bowl of a stand mixer outfitted with the paddle attachment. In a large measuring cup, combine all of the wet ingredients. With the mixer running on a low gear, slowly add the wet ingredients into the dry. Fill lined muffin tins three quarters full. Bake for 16-18 minutes. Completely cool before frosting. To make the frosting, combine all ingredients in the bowl of a stand mixer. Using a paddle attachment, whip on high until fluffy. Use a piping bag and tip to frost the cupcakes. “You’re giving each guest a personalized cake, many times giving them choice among several flavors, so they are much more likely to eat it, not leave it on the plate, wasted,” said Amy Alward, owner of Love Kupcakes in Portland, a bakery that uses local milk, butter and berries, unbleached flour, cage-free eggs and organic cane sugar in all of its treats. 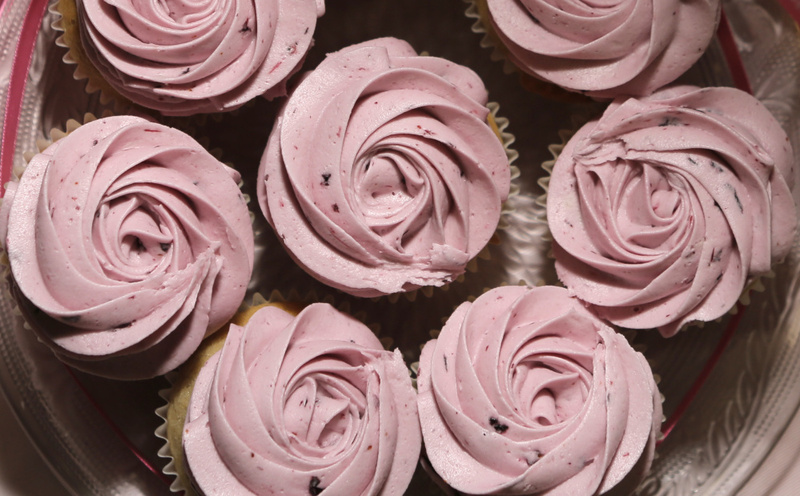 Alward advises brides planning small weddings (about 50 people, in her professional opinion) to select as many as five different cupcake and frosting combinations (such as Vegan Lemon-Blueberry) to be included in their dessert table arrangements. On the production side of the cupcake equation, the same ingredients required to make a 9-inch layer can yield 36 cupcakes or 72 mini-cupcakes. According to several baking books sitting on my shelf, a 9-inch layer cake can be divided into 16 pieces, generally, but as many as 22 with some creative knife work. Alward tells brides and grooms to allocate 11/4 to 11/2 cupcakes (or two to three minis) per guest. With that allotment, those same ingredients will provide as many as 28 guests with cupcakes or as many as 36 guests with minis. The energy it takes to bake cupcakes is less, too, as they require one-third less baking time than layer cakes. In terms of human energy, the labor cost for making cupcakes is half that of making and transporting multi-tiered wedding cakes, says Alward. Love Kupcakes’ staff, which provided cupcakes for 45 weddings last summer, also can pack their goodies in the large coolers it has on hand to rent so that caterers or brides and grooms already going to the reception venue can transport the cupcakes themselves in order to cut down on delivery fees and carbon emissions. Chalk this one up to big savings coming in little packages.